Tomb in Kensal Green Cemetery. Tomb in Kensal Green Cemetery. Detail. 2016. Commemorative plaque at Credition station. 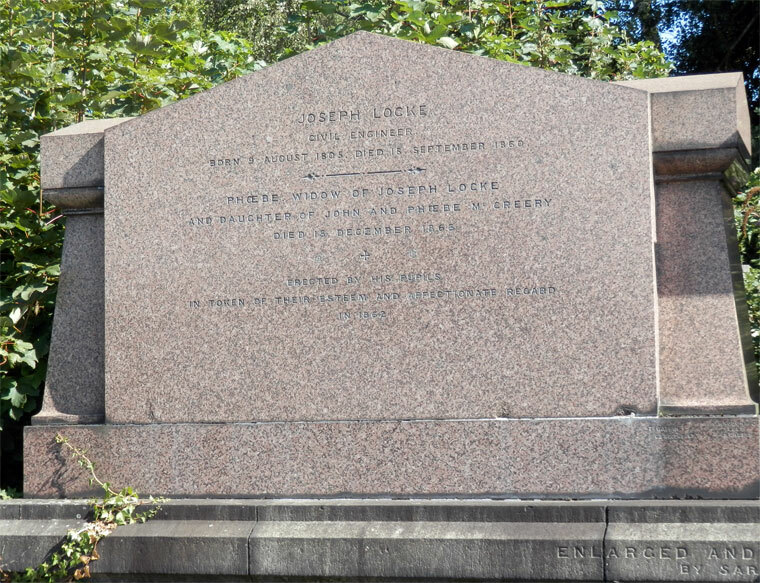 Joseph Locke (1805-1860) was a notable English civil engineer of the 19th century, particularly associated with railway projects. 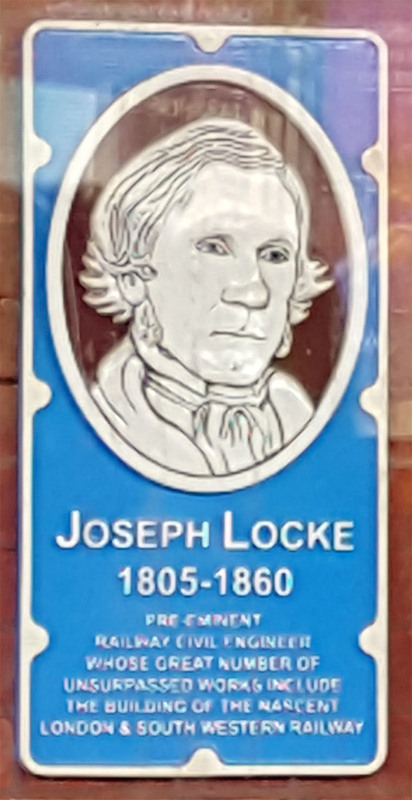 Locke ranked alongside Robert Stephenson and Isambard Kingdom Brunel as one of the major pioneers of railway development. 1805 August 9th. Born at Attercliffe, near Sheffield, on 9 August 1805, the fourth and youngest son of William Locke (b. 1770), colliery manager, and his wife, Esther, née Teesdale. 1810 He moved to nearby Barnsley when he was five. 1822 By the age of 17, Joseph had already served an apprenticeship under William Stobart at Pelaw, on the south bank of the Tyne, and under his own father, William. He was an experienced mining engineer, able to survey, sink shafts, to construct railways, tunnels and stationary engines. Joseph’s father had been a manager at Wallbottle Colliery on Tyneside when George Stephenson was a fireman there. In 1823, when Joseph was 17, Stephenson was involved with planning the Stockton and Darlington Railway. He and his son Robert Stephenson visited William Locke and his son at Barnsley and it was arranged that Joseph would go to work for the Stephensons. The Stephensons established a locomotive works near Forth Street, Newcastle upon Tyne, to manufacture locomotives for the new railway. Joseph Locke, despite his youth, soon established a position of authority. He and Robert Stephenson became close friends, but their friendship was interrupted, in 1824, by Robert leaving to work in Peru for three years. George Stephenson carried out the original survey of the line of the Liverpool and Manchester Railway, but this was found to be flawed, and the line was re-surveyed by a talented young engineer, Charles Vignoles. Joseph Locke was asked by the directors to carry out another survey of the proposed tunnel works and produce a report. The report was highly critical of the work already done, which reflected badly on Stephenson. Stephenson was furious and henceforth relations between the two men were strained, although Locke continued to be employed by Stephenson, probably because the latter recognised his worth. Despite the many criticisms of Stephenson’s work, when the bill for the new line was finally passed, in 1826, Stephenson was appointed as engineer and he appointed Joseph Locke as his assistant to work alongside Vignoles, who was the other assistant. However, a clash of personalities between Stephenson and Vignoles led to the latter resigning, leaving Locke as the sole assistant engineer. Locke took over responsibility for the western half of the line. One of the major obstacles to be overcome was Chat Moss, a large bog that had to be crossed. Although, Stephenson usually gets the credit for this feat, it is believed that it was Locke who suggested the correct method for crossing the bog. 1829 Whilst the line was being built, the directors were trying to decide whether to use standing engines or locomotives to propel the trains. Robert Stephenson and Joseph Locke were convinced that locomotives were vastly superior, and in March 1829 the two men wrote a report demonstrating the superiority of locomotives when used on a busy railway. The report led to the decision by the directors to hold an open trial to find the best locomotive. This was the Rainhill Trials, which were run in October 1829, and were won by “Rocket”. In 1829 Locke was George Stephenson’s assistant, given the job of surveying the route for the Grand Junction Railway. This new railway was to join Newton-le-Willows on the Liverpool and Manchester Railway with Warrington and then on to Birmingham via Crewe, Stafford and Wolverhampton, a total of 80 miles. During the construction of the Liverpool and Manchester Railway, Stephenson had shown a lack of ability in organising major civil engineering projects. On the other hand Locke’s ability to manage complex projects was well known. The directors of the new railway decided on a compromise whereby Locke was made responsible for the northern half of the line and Stephenson was made responsible for the southern half. 1830 When the line was finally opened in 1830, it was planned for a procession of eight trains to travel from Liverpool to Manchester and back. George Stephenson drove the leading train “Northumbrian” and Joseph Locke drove “Rocket”. The day was marred by the death of William Huskisson, the Member of Parliament for Liverpool, who was struck and killed by “Rocket”. 1830 Joseph Locke, a Civil Engineer practising in Liverpool, became a member of the Institution of Civil Engineers. 1834 Married Phoebe (1811-1866) the daughter of John McCreery, with whom he adopted a child. Stephenson’s administrative inefficiency soon became apparent and by autumn of 1835 Locke had become chief engineer for the whole of the line. This caused a rift between the two men, and strained relations between Locke and Robert Stephenson. Up to this point, Locke had always been under George Stephenson’s shadow. When the Grand Junction Railway came under the sole direction of Locke, he appointed John Edward Errington as resident engineer. 1837 Locke’s route avoided as far as possible major civil engineering works. The main one was the Dutton Viaduct across the valley of the River Weaver near Northwich. The viaduct consisted of 20 arches with spans of 20ft. The line was opened on 4 July 1837. An important feature of the new railway was the use of double-headed (dumb-bell) wrought-iron rail supported on timber sleepers at 2ft 6in intervals. It was intended that when the rails became worn they could be turned over to use the other surface, but in practice it was found that the chairs into which the rails were keyed caused wear to the bottom surface so that it became uneven. However this was still an improvement on the fish-bellied, wrought-iron rails still being used by Robert Stephenson on the London and Birmingham Railway. A significant difference between the surveying methods of George Stephenson and Joseph Locke was that, because Stephenson had started his career at a time when locomotives had little power to overcome excessive gradients, he avoided such gradients at all costs, often adding many miles to the line of the route, whereas Locke had more confidence in the ability of modern locomotives to climb these gradients. An example of this was the Lancaster and Carlisle Railway, which had to cope with the barrier of the Lake District mountains. In 1839 Stephenson proposed a circuitous route that avoided the Lake District by going all the way round Morecambe Bay and West Cumberland, claiming: 'This is the only practicable line from Liverpool to Carlisle. The making of a railway across Shap Fell is out of the question.' The directors rejected his route and chose the one proposed by Joseph Locke, one that used steep gradients and passed over Shap Fell. The line was completed by Locke and was a success. 1845 The Manchester to Sheffield line opened, after many delays, on 23 December 1845. The building of the line required over a thousand navvies and cost the lives of thirty-two of them, seriously injuring 140 others. The Woodhead Tunnel was such a difficult undertaking, that George Stephenson claimed that it could not be done, declaring that he would eat the first locomotive that got through the tunnel. It was estimated that the mortality amongst the navvies at the Woodhead Tunnel was just over 3 per cent, whereas the mortality amongst soldiers at the Battle of Waterloo was only 2.11 per cent. In the south, he worked on the London and Southampton Railway, later called the London and South Western Railway, designing, among other structures, Richmond Railway Bridge (1848, since replaced), and Barnes Bridge (1849), both across the River Thames, tunnels at Micheldever, and the 12-arch Quay Street Viaduct and the 16-arch Cams Hill Viaduct, both in Fareham (1848). He was actively involved in planning and building many railways in Europe, including the Le Havre, Rouen, Paris rail link, the Barcelona to Mattaro line and the Dutch Rhenish Railway. Distinctive features of Locke’s railway works were economy, the use of masonry bridges wherever possible and the absence of tunnels. An illustration of this is that there is no tunnel between Birmingham and Glasgow. Locke and Robert Stephenson had been good friends at the beginning of their careers, but their friendship had been marred by Locke’s falling out with Robert’s father. It seems that Robert felt loyalty to his father required that he should take his side. After the death of George Stephenson in August 1848, the friendship of the two men was revived. When Robert Stephenson died in October 1859, Joseph Locke was a pallbearer at his funeral. Locke is reported to have referred to Robert as 'the friend of my youth, the companion of my ripening years, and a competitor in the race of life'. Locke was also on friendly terms with his other engineering rival, Isambard Kingdom Brunel. In 1845, Locke and Stephenson were both called to give evidence before two committees. In April a House of Commons Select Committee was investigating the atmospheric railway system proposed by Brunel. Brunel and Vignoles spoke in support of the system, whist Locke and Stephenson spoke against it. The latter two were to be proved right in the long run. In August the two gave evidence before the Gauge Commissioners who were trying to arrive at a standard gauge for the whole country. Brunel spoke in favour of the 7ft gauge he was using on the Great Western Railway. Locke and Stephenson spoke in favour of the 4ft 8½in gauge that they had used on several lines. The latter two won the day and their gauge was adopted as the standard. 1860 September 18th. Locke died apparently from appendicitis, whilst on a shooting holiday. 1861 His wife is living at 23 Lowndes Square, Chelsea: Phoebe Locke (age 54 born Liverpool), a Fundholder. With her adopted daughter Minna M. Locke (age 12 born London). Also her cousin Eliza Murphy (age 64 born Weddington, Northumberland). Also a visitor. Seven servants. 1862 Locke Park in Barnsley was dedicated to his memory by his wife Phoebe in 1862. It features a statue of Locke plus a folly, 'Locke Tower'. 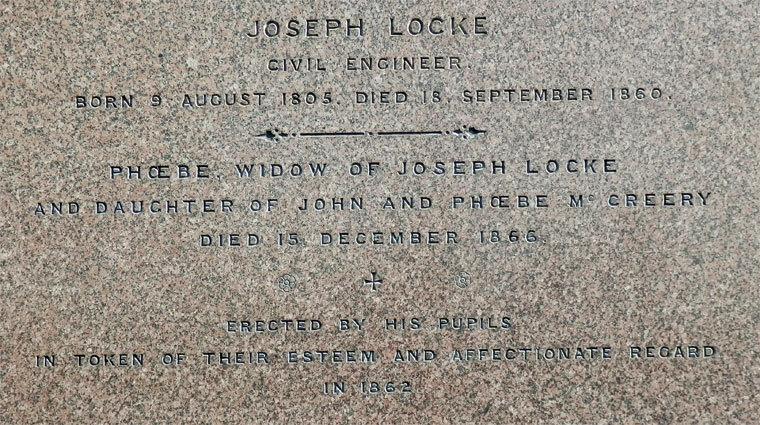 See the Locke Memorial in The Engineer 1866/01/26, pages 61 and 62.